Modern Quilting by B: My "By the Sea" Paper Piece Block is in Quiltmaker's 100 Blocks vol. 11! My "By the Sea" Paper Piece Block is in Quiltmaker's 100 Blocks vol. 11! I'm thrilled that Quiltmaker's 100 Blocks Volume 11 is featuring my By the Sea paper pieced quilt block! I truly enjoy making paper piece patterns and appreciate having the opportunity to share my work with Quiltmaker's readers. This is the By the Sea block that is featured in the magazine. It measures 12'' x 12'' and is all about the ocean; ships, beaches, sun and surf - the things of summer. Makes me yearn for the Outer Banks of North Carolina! I go there every year and when I do, I take a quilt with me. Maybe his year I'll be packing a By the Sea quilt! The magazine includes a full sized template as well as complete instructions for assembling the block so don't be shy about giving it a try. 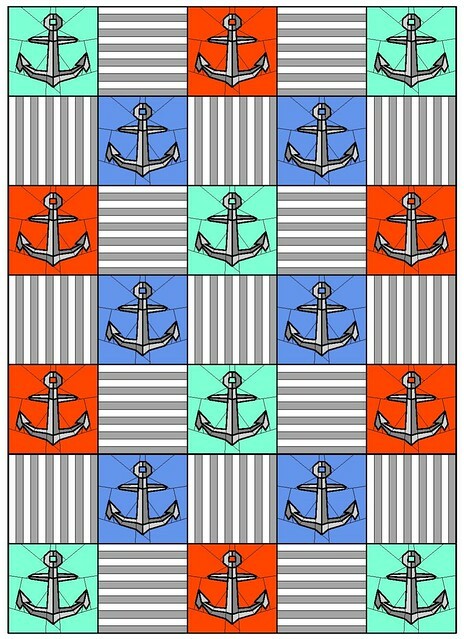 For my beach quilt, I think I'll mix three colors of anchors in with gray and white striped blocks. It doesn't get more nautical than that! Even if you're not at the beach can you envision someone cuddling with this in a cozy, nautically themed den or in a boy's room that is accented with toy sail boats and other sea related decor? I think so. If the thought of making a full sized quilt is a bit overwhelming, perhaps a simple wall hanging or table topper is more palatable. Four blocks sewn together would make a cute 2' x 2' mini quilt. 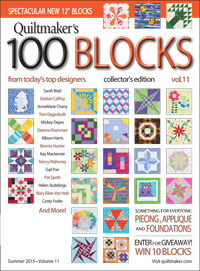 The publishers of Quiltmaker's 100 Blocks will be giving away a copy of Volume 11 to one of my lucky visitors. All you need to do to enter for a chance to win is leave a comment on this blog post; only one comment per person please. Be sure to include an e-mail address for me to respond to so that I can get in touch to receive shipping details. The draw will take place at 9:00 am US EDT on Saturday, May 9, 2015. The winner will be informed by e-mail and will be announced by an edit to this blog post. The magazine will be sent to the winner directly from Quiltmaker. Congratulations Kim! Kim has been contacted by email. 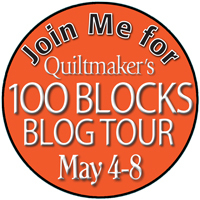 May 4-8 2015, Quiltmaker will be hosting a blog tour for many of the Volume 11 block designers. It promises to be a fun and educational event with lots of fresh ideas and giveaways. Be sure to check it out! Love the block! Thanks for the chance to win. Great block! I have never done any paper piecing, but maybe I have to start now?! What a lovely block and it's made easier with paper piecing! What a neat block you have created and have shared with us. This would be so cute to have in a boy's room. I just love it. Thank you for being a part of the QM's 100 Blocks, Volume 11, Blog Tour and the chance to win a copy of the wonderful priceless magazine. I really like this block and thanks for the chance to win. What an amazing block! Love the dimension. Thanks. Wonderful anchor and I still need to learn to paper piece. What a perfect block for a summer quilt! Paper piecing is one of my favorite techniques. Thanks for sharing. Great block - very nautical!!! I really like that you give more then one color combinations in your instructions! I hope to follow you as I like your style! Great block! This would make a great pillow for my lanai. Can't wait to get my hands on a copy so I can get started making your awesome block! Just finished my last paper piecing project and am ready to start a new one - this is it! What an unusual and creative block. So looking forward to this magazine! Really great block for a nautical themed quilt. Would make a cute baby quilt for just the right baby! 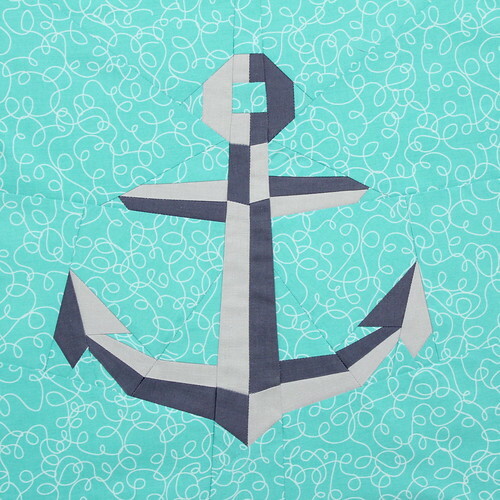 I am working on a nautical-themed kids quilt now that could really benefit form a few of your anchor blocks. Thanks for a chance in your give-away. Your block looks intricate but doable. I like how you used dark and light fabric to provide some depth and shading. Love this block. It's absolutely darling. Thanks for sponsoring the giveaway. Wonderful nautical block. Now I need the book to make it. Thanks for joining in the Quiltmaker 100 Blocks tour. I love seeing all the new blocks. What a fun design! It is just perfect for my quilt with sea animals on it and paper pieced. That makes it just delightful. Love to paper piece. Thanks so much for sharing. I love your block! Very original. Thanks! I like the block. I admire your skill. I can't imagine just sitting down and drawing a block. Wonderful block and I love anything nautical, perfect for the summer too. I am pretty fearful of paper piecing but I LOVE this pattern. May have to try my hand at it! Wish I had access to this block when I was making my nautical quilt! Maybe I will have to make another. Wow, this is a great block! congrats on being published. Ohhh this is wonderful. I would love to make this into a pillow for our front room, which is becoming ocean themed. my husband and I saw a pillow with an anchor on it. it was nice but nothing special. this would be perfect. thank you for sharing and for inspiring. This your block remains me about our holydays in Dannmark. There were anchors everywhere. Wow! Your "By the Sea" block looks 3-d! Such a great block - I'm always on the lookout for things that will work for men and boys. Can't you just see this in a pirate quilt for a young boy? Thanks so much for an opportunity to win a copy of the Volume 11 issue! I like the detail in this block. It would be effective used as a center surrounded by boat blocks. Cute block. I haven't tried paper piecing yet, but I do want to try it. I love the look of the larger quilt with the different colored anchors. I love foundation paper piecing. Thanks for sharing your fun block & thanks for the chance to win. I love you paper piece block and just in time for summer. Fun! Congratulations for having your block in the magazine! Beautiful block. I really enjoy paper piecing. Thanks for sharing. Great quilt block. It would definitely make a great beach quilt. What a neat block. Not sure how easy it would be to do, but may have to give it a try. My nephew's son loves anything to do with the ocean and I try to make him something ever year. Your block is so creative and timely. It's stunning. Great block! Looks like a bit of a challenge for me but, I think I might enjoy making a pillow with this design for my dad. Thanks! I'm a boater, so I love this block! Thanks for the giveaway. We go to the Outer Banks (Duck)every year as my sister-in-law lives there. Your block is great and I like the stripe blocks with it. Thanks for a chance to win. Great block, my son is in the navy so I especially enjoyed seeing your anchor quilt. My nephew would love a quilt made of anchors. Thanks for sharing the full quilt picture. Haven't done much paper piecing but your block may tempt me to try! Oh boy...what a winner. I know a certain sailor that is getting this. Enjoy the rotating version. Love the block. I would mix this with some ocean blocks with dolphins and whales. This would be perfect for a seafaring person - Navy maybe? Has many possibilities. Your By the Sea block is great! Love the anchor block. I have been looking for one. Nice colors! What a great block for water lovers! 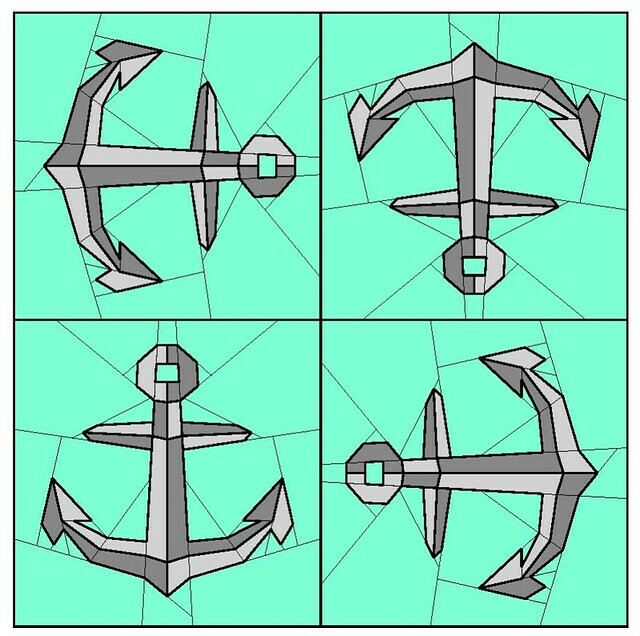 An anchor is so unique! Beaches sound good right now. My kids love the water, so swimming lessons are in order. I love nautical -your block is great! thank you! this is a great block - my sister loves the ocean, so this will be tagged to make her a wall hanging! Great Block! I've only done one project with paper piecing and your pattern has me in the mood for another! I have not tried paper piece yet but I want to soon. Your block is very unique and would be fun in a beach theme or nautical theme quilt. Congrats on being chosen to be in the magazine. Ahoy, matey! A great block for Florida where you're never far from water - salt or fresh. I have recently fallen in love with paper piecing! Great Block! I live on a lake, so this block would be perfect as a throw pillow--love it! You're very right about this block being great for a boys quilt. With 5 grandson's to make quilts for, I'm always looking for a new pattern! Very cute block; could be used for my 4 grandsons' quilts! This might be a good time to learn paper piecing! what a great block! I have some boaters in the family that would love this!! I LOVE your block. I can hardly wait to get the magazine to make it. I love the combination of the anchors and stripes. Wow, By the Sea is so nice. Love the colors you picked. What a fun block! I just took a paper piecing class, and that opened up a whole new world of quilting opportunity! Love the anchor block! I haven't tried pp yet-but I think I am going to have to eventually since you can do so much with it! Thanks for a chance to win! I love paper-piecing. Thanks for the great block! Cute Anchor Block!! Definitely a fun project! Paper piecing is my absolute favorite! Fun block. LOVE this block! Anchors are just classic! Wonderful block! I know I will want to use this for a QOV quilt.